As you down your third margarita or taco on Cinco de Mayo, enjoy a laugh at Delaware's expense. The folks at cabletv.com took a look at what Americans were Googling on May 5, 2016. 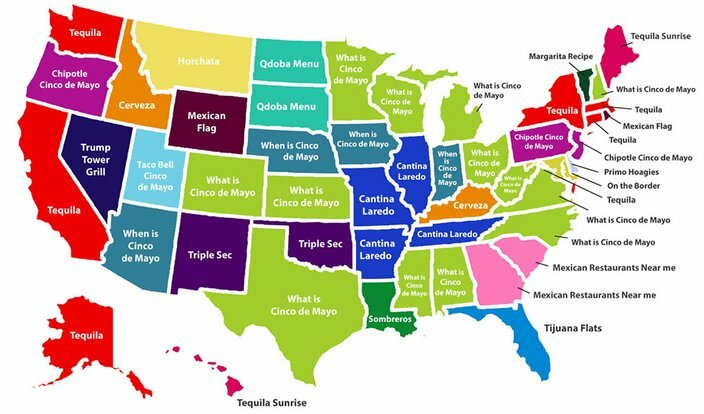 Specifically, the site analyzed Google search data for each state on the day we celebrate with Mexican food and drink. The good folks of Pennsylvania and New Jersey would seem to associate the holiday with a trip to a Mexican chain restaurant. The top search term in both states was "Chipotle Cinco de Mayo." All in all, that makes some sense. Now, the story is a bit different in "The First State." Delawareans apparently mark the year's biggest Mexican-American holiday by ordering a ... Primo hoagie. Sí, that was the top search term: "Primo hoagie." If you’re one of the searchers in a state with food-related search trends (we’re looking at you, Delaware! ), we’d suggest skipping the chain and celebrating the day by supporting local, Mexican American-owned restaurants. We guarantee it’ll taste better. • Fourteen states, plus Washington D.C., searched for terms revolving around drinks, with 93 percent of those directly related to alcoholic drinks — mostly tequila. Montana was the only state to have the non-alcoholic beverage horchata (a cinnamon-vanilla rice drink) as its top-searched term. For more on their findings, check out the report at cabletv.com.